Packaging materials strongly affect the effectiveness of an electronic packaging system regarding reliability, design, and cost. In electronic systems, packaging materials may serve as electrical conductors or insulators, create structure and form, provide thermal paths, and protect the circuits from environmental factors, such as moisture, contamination, hostile chemicals, and radiation. 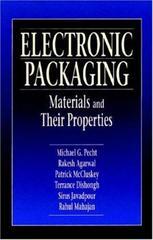 Electronic Packaging Materials and Their Properties examines the array of packaging architecture, outlining the classification of materials and their use for various tasks requiring performance over time. Electronic Packaging Materials and Their Properties also reviews key electrical, thermal, thermomechanical, mechanical, chemical, and miscellaneous properties as well as their significance in electronic packaging.